An ancient and priceless piece of jewelry, the Moonstone, has been stolen, and it`s up to you to track it down! 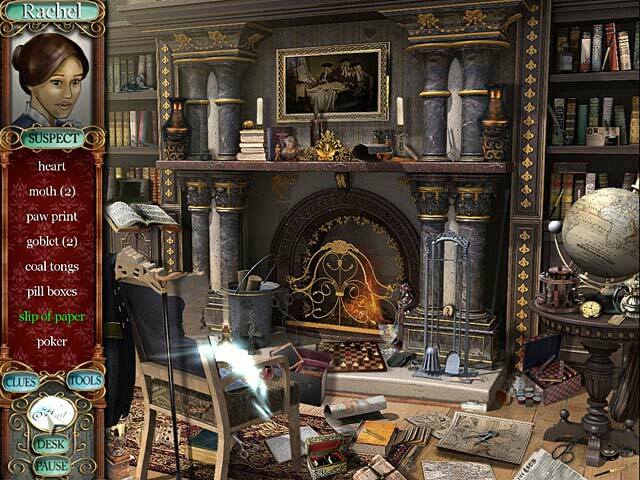 Investigate every person who was in the mansion at the time of the crime to solve the mystery and catch the crook, in this Hidden Object game! Explore every room of the mansion to find valuable clues in Mystery Masterpiece The Moonstone, and return the jewel to its rightful owner. 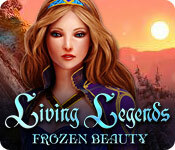 Spot hidden objects and solve puzzles and mysteries in lush, eye-catching scenes. There are a lot of great games out there to play. This one gets boring real fast. I'd spend my money on a better game. 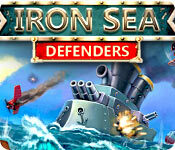 check out the best game list and pick something with 5 stars. A good game for a beginner, but nothing to hold the interest of anyone who has played the newer games. I wish they had an option of "Maybe" for recommendation. I'd recommend it for a beginner; also for those who want to play a game that doesn't involve the supernatural. If you like HO only games, you might like this one. It is different. There is no real story other than that a diamond has been stolen. For each character you search four rooms looking for "clues." The objects are often, but not always, clear and findable, but in my mind they "cheat" in that they will "hide" something completely invisibly in a shadow of something the same color. They are also very clumsy about not putting two kinds of an object in, one by accident. There are times where an object absolutely could be what you are looking for, but they have decided it isn't. The idea of the game is cute but the HOS get pretty boring. After all, you have to go through about 40 of them, with nothing in between. The slightly more complex things are completely unexplained. I would have preferred one room per suspect, not four. Basically I was wishing it would end so I could see what happened. The end was cute but didn't at all make up for the annoyances. Some people might like it - I didn't hate it- and there was not one glitch. Have fun if you try it. The good things about this game: The HO scenes are very pretty, and the music is lovely. HO gameplay is not easy. Many of the objects are extremely well hidden, and this is good if you like a hunting challenge. The bad things about this game: The 'cut scene' artwork leaves much to be desired, and the voice overs are terrible. I skipped all the scenes and opted to read the info instead. Clicking has to be very precise to pick up the HOs, but there is no penalty for bad clicks, so it's not too much of an issue. Hint system does not work well. May as well have not even bothered with that. Story is only mildly interesting. The bottom line: This is a decent game if you can get it on sale. The attractive and challenging HO scenes *almost* make up for the poor story and game mechanics. This game should NOT have been included in the Hidden Objects genre! Just because the player must search for every item needed to progress beyond standing still does NOT make it a hidden object game! This is a BUT FIRST...game--you need to leave the roof top, BUT FIRST you have to find a hook...BUT FIRST you have to find a knife to open the satchel that hides the hook...BUT FIRST, you have to find a strong stick to attach the hook to...You get the picture, I am sure. Yes, the graphics were of acceptable quality and yes, I thought the story line/premise of the game was intriguing, thus I downloaded the game (free download only). It was an exercise in frustration for me. I do not enjoy the But First games, they are usually Adventure games. Of the 75+ games I have downloaded/bought/played here on BF, I haven't come across another as frustrating as this one (thank goodness!). IF you like adventure games that involve major amounts of searching, thinking, seeking and putting items together to make another, then this is a game for you. IF you are expecting a lovely bit of HO seeking, this is NOT the game for you! I hope that whoever is responsible for choosing the genres of the games will be more strict on their qualifications in the future. I just wasted minutes of my life I cannot get back because this game was billed as a HO game...instead a got a whole lot of frustration, searching, clicking and finally giving up! SKIP THIS ONE if you are looking for a HO game with some adventure facets to it--this is totally the opposite and I did not come across any traditional HO scenes in the time I played. I'm finding this game fun & different. It's true that many of the items are hard to find, but that just makes the hidden object scenes more challenging, which I prefer. I haven't failed to find everything in a scene yet. I almost passed this up because of the 1-star and 2-star reviews. I'm glad I didn't! Just goes to show that what floats your boat is different for different people. It has a higher level of challenge than most other games in this genre. Almost 4 hours. STORYLINE: A moonstone diamond for Rachel?s birthday has disappeared and it appears to be an inside job. Help the detective interview the 9 people in the mansion at the time of the disappearance to find the culprit. GAMEPLAY: There are 4 rooms per suspect. The HOS encompasses the entire room, which is somewhat cluttered but orderly. Some of the objects are very well hidden. 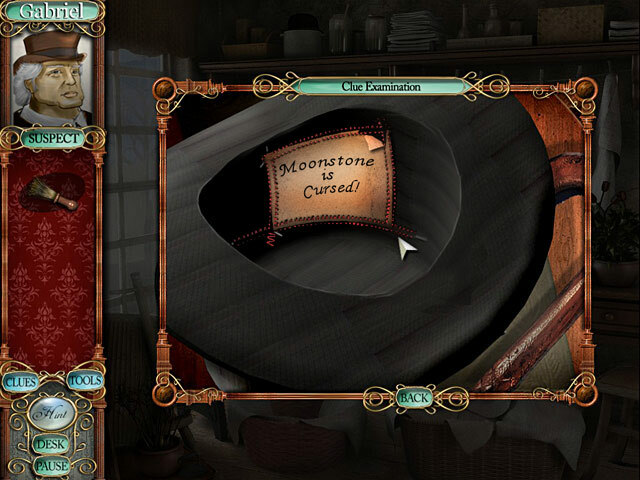 Occasionally you may need to examine another room to get a tool (such as a scissors, teapot with boiling water) for solving simple puzzles. After each investigation, the detective interviews the suspect and prepares a profile, including his/her testimony and the detectives observations. At the end, you determine who the culprit is. You can skip the interview since it is included in the profile. SUMMARY: Charming and simple HOS with nice voice overs and lovely graphics, appearing true to the mid-1800s circa of the case. I love this game for one definite reason.. the background music. It really fits the era and setting of this game. I replay this game over and over because of the music. If only I could download them, so that I don't have to play this totally HOG game, I will do it. 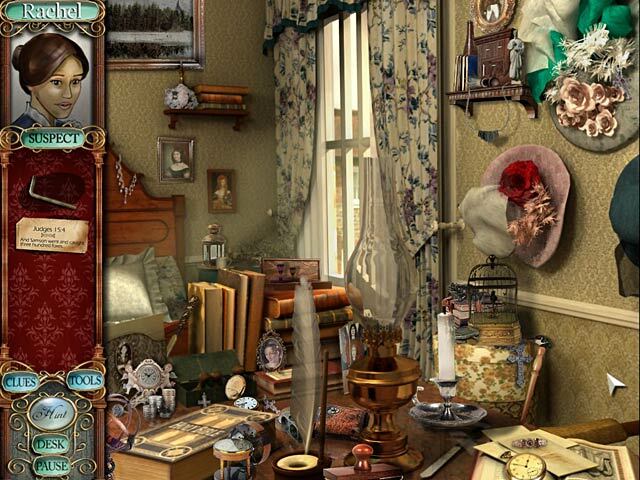 The hidden object items are same throughout, means it will not go random even though you replay this game again. After several play, you will surely remember where it is. There is mini game but super mini as it only involves you using an item found in a scene. I like the ending where you have to guess the culprit but even though you guess it wrong, you can choose another character, and it goes on until you find the right one. Sadly the music itself cannot save this game, so until and unless you have a game coupon or credit to spare, do not buy this game.